When you combine several 2D transforms into a transform group, the order in which you list the constituent transforms matters. 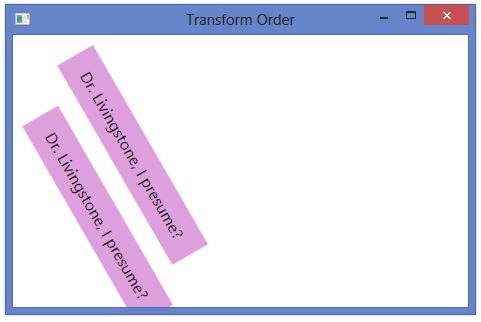 The transforms are applied in the order that you list them in the TransformGroup. The order that they are applied in makes a difference, because if you translate and then rotate an object, you get a different result than if you rotate the object first and then translate it. In the example below, the labels start out on top of each other, but end up at different positions, because the order of their transforms is different. <Label Content="Dr. Livingstone, I presume?"